This entry was posted on January 10, 2012 by vitacaptus. 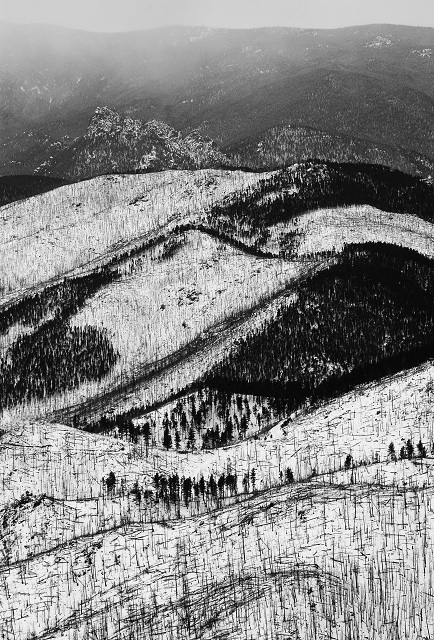 It was filed under Ansel Adams, Black and White, Colorado, Landscape Photography, Mountains, Snow, Winter and was tagged with Ansel Adams, Black and White, Colorado, Landscape photography, Michael S. Glass photo gallery, mountains, snow, winter. Love the picture, but it always makes me sad to see an area that looks as if there has been a fire and even possibly strip logged. Thank you for sharing. Thanks for the comments Max. The picture was taken near my step-brother’s house in Pine, Colorado and was subjected to a fire a few years before the picture was taken. I agree that striped log areas are sad to look at. Fires, even though not always naturally caused, in my opinion can be good for an area because they help with regrowth and regeneration of vegetation in the area. Not always a good thing though.